I’m tired. 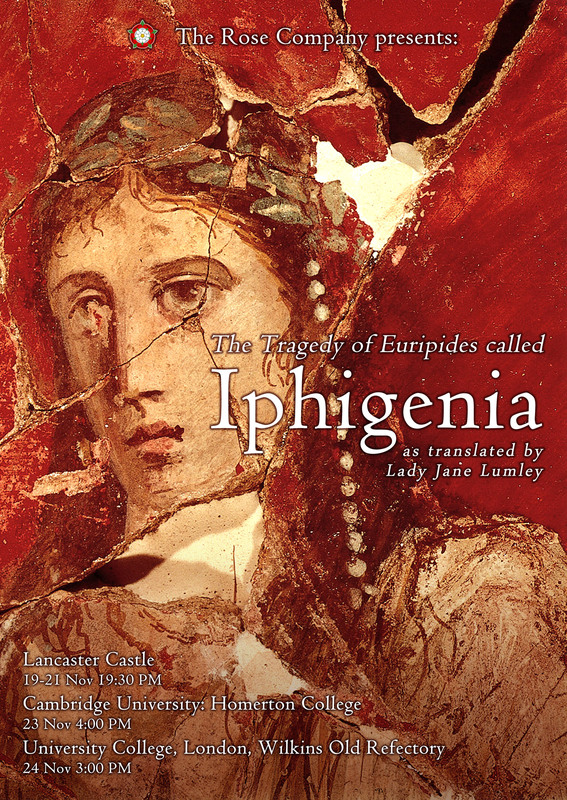 I’ve spent almost the whole day publicising Lady Jane Lumley’s Iphigenia, a Rose Company production and this blog is the final thing on my to do list. I’ve contacted: two radio stations; two local newspapers and (very scarily) one national paper; several schools and other educational establishments; some theatres; an online local website; as well as family, friends and any and every person I can think of who might conceivably be interested. I started by saying I was tired, though: I am; I don’t find publicising shows easy. Not easy at all – and I never have. Publicity has to be done early in the rehearsal process in order to give an audience time to organise diaries and buy tickets, but as it is early, it always feels strange to me because the show has yet to really take shape, so I generally don’t feel absolutely certain what it is I’m publicising and I don’t want to give mis-information or to under-sell. This time is a little easier because November’s Iphigenia is a revival of July’s show, so I have much, much more idea than I sometimes do! I also find the self-promotion aspect of publicity difficult – and I know I’m a long way from being alone in this. Many performance artists/makers are essentially private, even shy, people, but in order to gain the audiences they need/crave, they have to confidently promote themselves and their work. As a director, I try to look at it as largely advertising the talent and work of my team, which I find much easier to do than focusing on myself. To help with this, I aim only to work with people whose talent and commitment I rate and on projects/productions in which I really believe. The Rose Company’s Iphigenia is no exception to this and I’m already excited about – and proud of – its cast and designer. So, onto the shameless plug of the title – you knew it was coming! 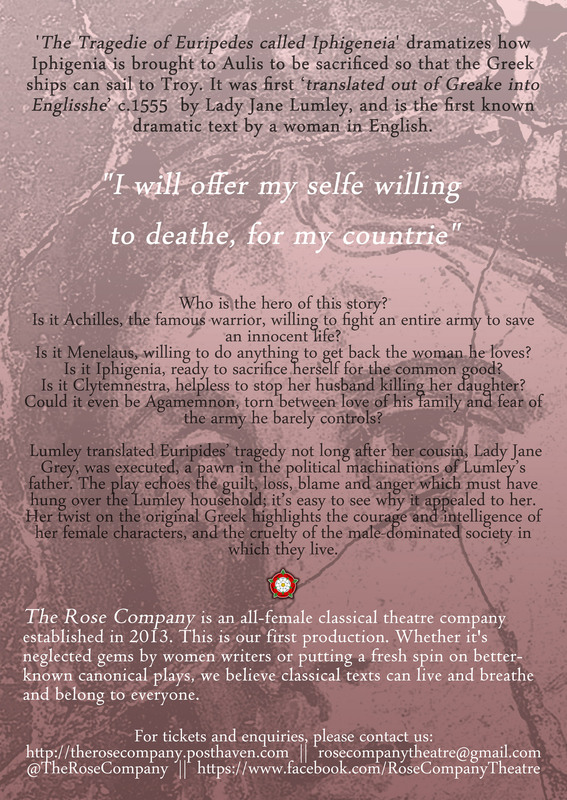 Please make time to see The Rose Company, Lancaster’s new all-female company, perform Lady Jane Lumley’s Iphigenia this November. Running time is approximately 70 minutes and tickets are £5 for all venues. They can be reserved by contacting The Rose Company on rosecompanytheatre@gmail.com and payment should be made in cash on the door of the production. Don’t miss the chance to see this extremely rarely performed gem – the first piece of dramatic literature by a woman in English and the first known translation of Euripides into English. Hope to see you at one of the shows – and please tell your friends! I don’t know Sir Nicholas Hytner. (I met him once and babbled incoherently at him through nerves, so I hope he doesn’t remember me.) However, as a theatre director myself, though ever such a lowly one, I can imagine that at the very least he feels irritated by an article that has been feverishly circulating twitter and facebook today. The article has the sub-heading “National Theatre director Nicholas Hytner admitted he found performances of the Bard’s works confusing – and he’s not alone” (taken from theguardian.com) and goes on to say that much of Shakespeare is essentially incomprehensible to most people and that only via reading it on the page can anyone hope to understand it fully. “Most people have tuned in.” I think that needs repeating. Very different then, from the tone of the article I read earlier today. To get onto one of my soapboxes, Shakespeare wrote all his plays to be performed, not read. He wrote them using the language of the stage and, as long as the director, cast and crew work hard to understand that language themselves and then perform it truthfully, they will carry an audience with them and understanding will naturally occur. It will. I’ve experienced it countless times on both sides of the fourth wall and with performers and audiences who have had vastly different levels of Shakespearian experience – from complete novice to expert. I’m going to give the final word to Hytner. This is again taken from The Radio Times interview, but this didn’t merit being highlighted in the sub-heading.